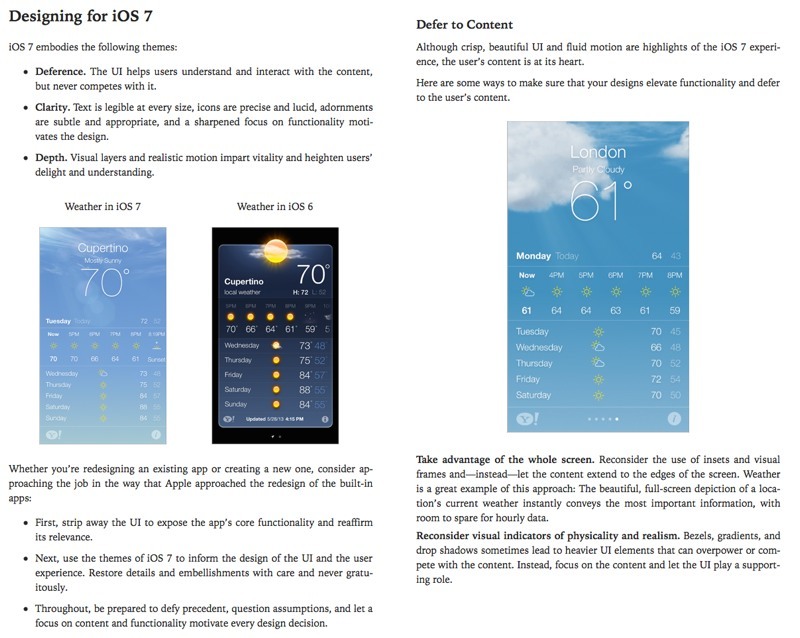 Apple has published its iOS Human Interface Guidelines to iBooks. The guidelines are Apple's recommendations and suggestions to developers for designing cohesive and usable apps that follow similar user interface principles to other iOS applications. The company has long offered user interface guidelines, dating back to the original Macintosh, but has recently only offered its iOS 7 guidelines on the Developer Portal. By making them available to anyone via iBooks, the company appears to be looking to inform and inspire more designers. - Deference. The UI helps users understand and interact with the content, but never competes with it. - Clarity. Text is legible at every size, icons are precise and lucid, adornments are subtle and appropriate, and a sharpened focus on functionality motivates the design. - Depth. Visual layers and realistic motion impart vitality and heighten users’ delight and understanding. - First, strip away the UI to expose the app’s core functionality and reaffirm its relevance. - Next, use the themes of iOS 7 to inform the design of the UI and the user experience. Restore details and embellishments with care and never gratuitously. - Throughout, be prepared to defy precedent, question assumptions, and let a focus on content and functionality motivate every design decision. The iOS Human Interface Guidelines are a free download from iBooks. I notice that the iOS 6 version of Weather is much easier to read and use than the iOS 7 version. If iOS 8 has the same esthetic and usability problems as iOS7, Apple has not listened to any user feedback. Or at least not to the user feedback that disagrees with Jony Ive. Apple loves Jony Ive more than it loves all its customers combined. Wouldn't it be wonderful to be Jony Ive! I admired his industrial design. Then he started trashing user interfaces, and I wish he'd just go away. Pardon me but in my opinion the iOS 6 weather app looks hideous, iOS 7 is UI/UX design done right. The new weather app is pretty, but it's less usable. The text is much harder to read in many areas, and its layout is almost devoid of organization. When you need more info than the background weather fx conveys, it actually takes more time and mental effort to find and absorb it compared to the older app. It's like a work of art instead of a tool. Pretty. Not efficient. Prettiness awes initially, but tools actually stay useful. The readability of the weather app in iOS 7 here is due to compression making the text blend with the background - I can assure you it's not an issue on the actual phone and is a million miles better looking than the previous version. Your assurances are bologna. It is harder to read. Period. Impossible to read? No. But less legible than the iOS 6 weather. Irrefutably. Just in case you don't know how to fuglify your app, here is a guideline for you. I still have a copy of the original Macintosh Human Interface Guidelines from 1984. Agreed, the iOS6 version is not only much easier to read, it is also much better looking. This. He managed to completely ruin a perfectly fine and gorgeous UI. I like the new functions in iOS7, but the design? Ugh... Worst thing I have seen in a very long time. I'm shocked they let this happen. iOS 6 at a glance tells me all I want to know. Guess I'm a picture type of guy. iOS 7 I have to read. Stop look read. For what its worth thats how it works for me and plenty of others I know. The bordering, shading and boxing in of stuff in iOS 6 is there to make things more readable. They serve a purpose to draw the eye quickly. I like that. iOS 7 is like looking at water and everything blending into it. I agree. Just using this Weather app as an example, with iOS6, I could quickly launch the app, look at the weekly forecast and see a very clear pictorial representation of a sun, or partly cloud, or rain, or whatever and my brain would recognize it in less than a second and I could turn the phone back off. With iOS7's wireframe icons, I have to look at each day's icon more carefully to determine exactly what it's depicting. Are they impossible to interpret? Of course not. But there's a noticeable difference in the effort required to interpret them. This is supposed to be progress? It suggests that they do not intend to introduce a major version of iOS at WWDC this year. Seems odd that they would publish a version of the HIG that will be outdated in three weeks - if iOS 8 is introduced at WWDC 2014. Unless the reason they're making it public is because it's outdated. But that seems like a stretch to me. There's easier ways of publishing old/archived material, like making the PDF available for download somewhere on Apple.com. iOS 1 through 6 looked largely the same. There's no reason to think that iOS 8 won't follow the pattern and stick with iOS 7's "Human Interface" guidelines. "...Text is legible at every size, icons are precise and lucid..."
A.K.A. Those stuck in the past. No, those that understand human interface design as professionals. Unlike yourself. Exactly. I don't understand why this is so difficult to grasp for so many. I remember Jony Ive saying something like "new is easy, better is hard" in regards to design. Looks like he buckled under the tech press's pressure and gave us "new" instead of "better". iOS 7 is mostly "prettier" than it's predecessor. But the complete elimination (and not a reduction where appropriate) of photo-realism (and skeumorphism) is detrimental to usability, and this is a great example. The whole "users already know how to use ..." mentality is bulls%*t. It used to be where users didn't need to know a damn thing. Alas, it's all about money and ego now, not "the best products". I wish Ive would "retire" so Apple could give someone else a shot at the title. 100% right. The whole reason iOS devices EARNED their place in popularity and customer preference is the GUI. They've destroyed that with the changes that require prior experience and do not service those that are new to this kind of technology. Uhh... you sure told them. You have put them in their place. Ohh the shame they must feel right now ??? Through the roof ! Good thing we have elevated persons like you from the present, no no, from the future, to bring upon us the enlightenment of the revolutionary UI design of thin light text instead of buttons.